And the dish ran away with the spoon..
Here’s our very good friend Dave a Ferguson demonstrating the art of Harp Boxing. 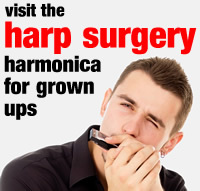 It’s a combination of beat boxing and harmonica playing. Dave is an expert at both and he uses his pedal board to build every song live from scratch, while entertaining his audience.